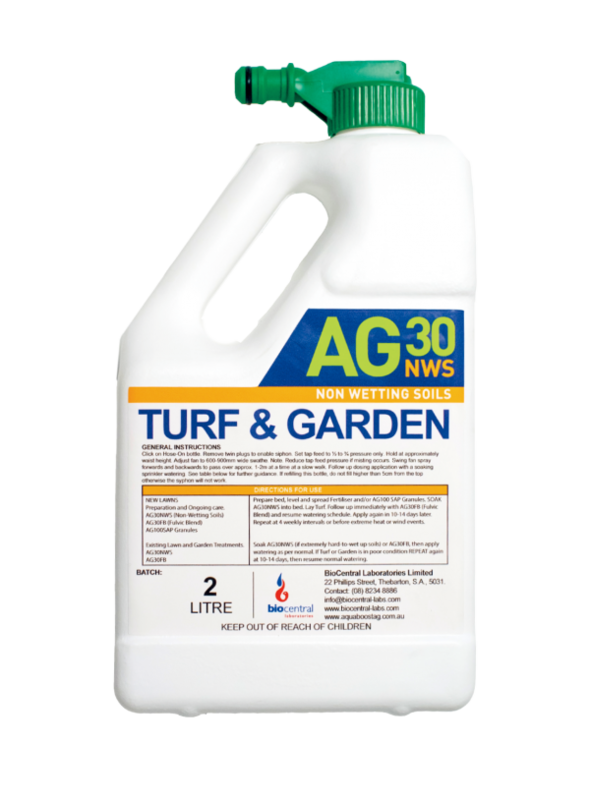 AquaBoostAG Turf & Garden - Better Than WetterBioCentral Laboratories Ltd.
AquaBoostAG30 NWS has been shown to significantly reduce irrigation requirements and associated water and power costs. AquaBoostAG30 NWS has consistently been shown to produce crops of higher quality and greater yield. It is suitable for use on all crops and in all irrigation systems. AquaBoostAG30 NWS is formulated with a non-ionic surfactant which is designed to overcome hydrophobic soil (non-wetting) characteristics. Hydrophobicity can be found in a wide range of soil types from sandy to hard setting and compacted clays. AquaBoostAG30 NWS is a patented polymer solution which increases irrigation and fertiliser efficiency by altering soil hydraulics, slowing the infiltration of moisture through the soil profile, promoting lateral spread and maintaining water and nutrients in the root zone for a longer period. 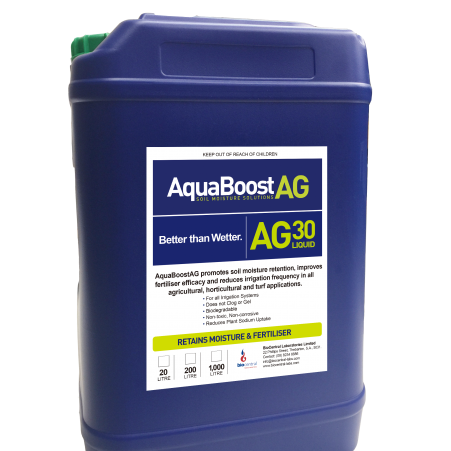 AquaBoostAG30 NWS, by encouraging the lateral spread of water through the soil profile, interrupts the natural tendency of water to follow pathways of least resistance. Maintaining a body of water around the roots helps prevent salt uptake. AquaBoostAG30 NWS has been shown to significantly reduce irrigation requirements and associated water and power costs. 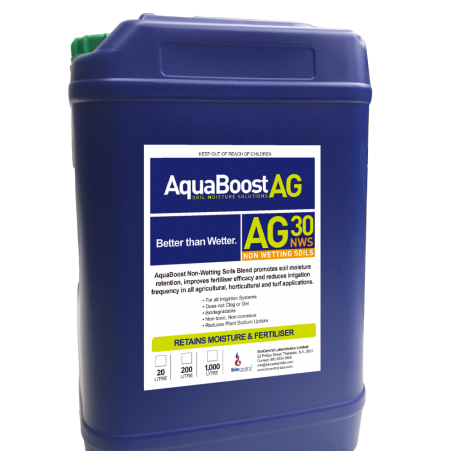 AquaBoostAG30 NWS has consistently been shown to produce crops of higher quality and greater yield. Where crops are grown in dryland situations, AquaBoostAG30 NWS effectively harvests rainfall holding the moisture in the plant’s root zone. 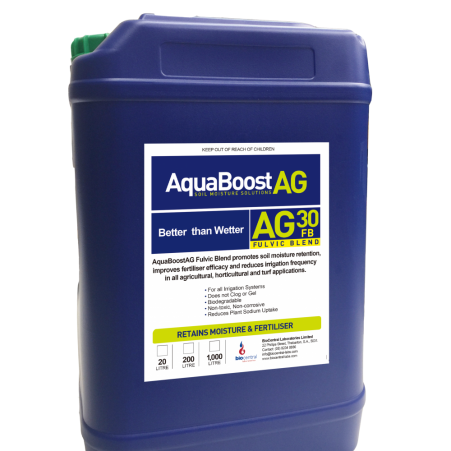 AquaBoostAG30 NWS is suitable for use on all crops and in all irrigation systems.